TLC Pulls Duggar's "19 and Counting" From Schedule. Blaze Columnist Defends Duggar Family: "Progressives Are The Problem". Home/Entertainment/TLC Pulls Duggar’s “19 and Counting” From Schedule. Blaze Columnist Defends Duggar Family: “Progressives Are The Problem”. TLC has remained stubbornly silent about the Josh Duggar sexual molestation scandal and even now has not acknowledge the oldest Duggar son’s scandal. lBut according to TMZ it has pulled the Duggar family show “19 and Counting” from its schedule. For now. TMZ is also reporting that General Mills has “blacklisted” the show. So how much more disgustingly can this situation become? Well there are some in Teabagastan who are actually trying to defend Duggar and his family. 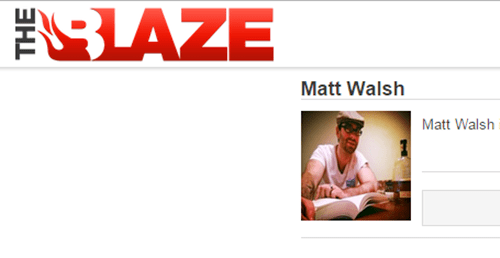 Take CON -(artist)-servative “journalist” Matt Walsh over at The Blaze who gets paid to do nothing more than be a contrarian douchebag. hey are moral opportunists. They are the actual hypocrites. This outrage is a charade. A circus. A show. A political ploy. This is the oh so very moral right standing up for an admitted sexual molester who fondled his own sisters. The REAL problem is Josh Duggar sexually molested his younger sisters while they were sleeping. The REAL problem is Jim Bob. Duggar LIED about enrolling Josh in a “Christian program” for treatment. The REAL problem is Jim Bob and Michele Duggar LIED about Josh receiving counseling. TheyREAL problem is they lied and pretended to get their son help, rather than actually doing it. Walsh glosses over the fact that “they sent Josh to do physical labor for 3 months.” Yes, but they LIED and said he was enrolling in a Christian program. They LIED and said that Josh was receiving counseling. And they have ADMITTED to these lies. They didn’t help their son, they lied about helping him. That right-wing “journalist” like Matt Walsh would perversely twist this situation to try to defend Josh Duggar and his family. THAT is the REAL problem. Not the progressives. What in the actual f*** is wrong with you?!!? Directed at the Blaze obviously.